Your arteries carry oxygen-rich blood away from the heart to the head and body. There are two carotid arteries (one on each side of the neck) that supply blood to the brain. The carotid arteries can be felt on each side of the neck, immediately below the angle of the jaw. There are two smaller arteries called the vertebral arteries that supply blood to the back part of the brain (the brainstem and cerebellum). 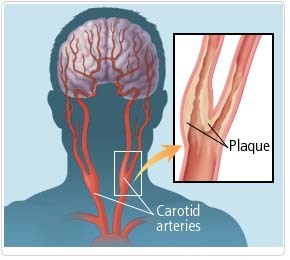 Carotid artery disease, also called carotid artery stenosis, is the narrowing of the carotid arteries, usually caused by the buildup of fat and cholesterol deposits, called plaque. Like the arteries that supply blood to the heart (the coronary arteries), the carotid arteries can also develop atherosclerosis on the inside of the vessels. The artery becomes extremely narrowed. A piece of plaque breaks off and travels to the smaller arteries of the brain. A blood clot forms and blocks a narrowed artery. A stroke can occur as a result of other conditions, such as sudden bleeding in the brain (intracerebral hemorrhage), sudden bleeding in the spinal fluid space (subarachnoid hemorrhage), atrial fibrillation, cardiomyopathy or blockage of tiny arteries inside the brain. Typically, the carotid arteries become diseased a few years later than the coronary arteries. People who have coronary artery disease have an increased risk of developing carotid artery disease. Sudden loss of vision or blurred vision in one or both eyes. Weakness and/or numbness on one side of the face or in one arm or leg. A TIA is a medical emergency since it is impossible to predict if it will progress into a major stroke. If you or someone you know experiences these symptoms, get emergency help (Call 9-1-1 in most areas). Immediate treatment can save your life or increase your chance of a full recovery. TIAs are strong predictors of future strokes; a person who has experienced a TIA is about 10 times more likely to suffer a major stroke than someone who has not experienced a TIA. Carotid artery disease may not have symptoms. It is important for those at risk to have regular physical exams by their doctor. A doctor will listen to the arteries in your neck with a stethoscope. An abnormal rushing sound, called a bruit (BROO-ee) may indicate you have disease. Bruits are not always present when blockages are present and may be heard at times even with minor blockages. It is important to let your doctor know if you have had any symptoms, such as those listed above. Carotid duplex ultrasound. An imaging procedure that uses high-frequency sound waves to view the carotid arteries and to determine the presence of narrowing. Carotid angiography (carotid angiogram, carotid arteriogram, carotid angio). An invasive imaging procedure that involves inserting a catheter into a blood vessel in the arm or leg, and guiding it to the carotid arteries with the aid of a special x-ray machine. Contrast dye is injected through the catheter so that x-ray movies of your carotid arteries are taken. This test may be performed to evaluate or confirm the presence of narrowing or blockage in the carotid arteries, determine the risk for future stroke, and evaluate the need for future treatment, such as angioplasty or surgery. Computerized tomography (CT scan). A CT of the brain may be performed if a stroke or TIA is suspected to have already occurred. This test may reveal areas of damage on the brain. Control high blood pressure, cholesterol, diabetes and heart disease. Have your doctor check your lipid profile and get treatment, if necessary, to reach a lipid. goal of LDL less than 100 and HDL greater than 45. Eat foods low in saturated fats, trans fats, cholesterol and sodium. Exercise regularly - at least 30 minutes of exercise most days of the week. All people with carotid disease should take aspirin as prescribed to decrease the risk of stroke due to blood clots. Talk to your doctor about other options if you are unable to take aspirin due to an allergy or other medical condition. In some cases, Coumadin (warfarin) may be prescribed. If so, blood work will need to be checked regularly to ensure you are prescribed the proper dose. Antiplatelet medications such as Plavix (clopidogrel) may also be prescribed. Carotid stenting. Carotid stenting is a treatment option for certain patients with carotid artery disease. Performed in a catheterization laboratory, a small puncture is made in the groin. A specially designed catheter, with an umbrella tip, is placed over a guide wire and directed to the area of narrowing in the carotid artery. Once in place, a small balloon tip is inflated for a few seconds to dilate the artery. Then, a stent (a small stainless steel mesh tube that acts as a scaffold to provide support inside your artery) is placed in the artery and opens to fit the size of the artery. Tiny filters are used to capture any particles that are released and prevent them from going to the brain and causing a stroke. The stent stays in place permanently. After several weeks, your artery heals around the stent. Carotid endarterectomy. This is the traditional surgical treatment for carotid artery disease and has proven to benefit patients who have a 50 percent or greater blockage in the carotid artery. While the patient is under general anesthesia, an incision is made in the neck, at the location of the blockage. The surgeon isolates the artery and surgically removes the plaque and diseased portions of the artery. Then, the artery is sewn back together to allow improved blood flow to the brain. Carotid Artery Disease Treatment India, Cost Carotid Artery Disease Treatment ,Carotid Artery Disease Treatment India, Low Cost Carotid Artery Disease Treatment Delhi India, Carotid Artery Disease Treatment Hospital Delhi, Carotid Artery Disease Treatment Mumbai Hospital, Cost Carotid Artery Disease Treatment Mumbai, Delhi-India, Low Cost Carotid Artery Disease Treatment Hospital, Affordable Carotid Artery Disease Treatment Hospital Mumbai, Delhi, Cost Carotid Artery Disease Treatment Hospital Delhi.